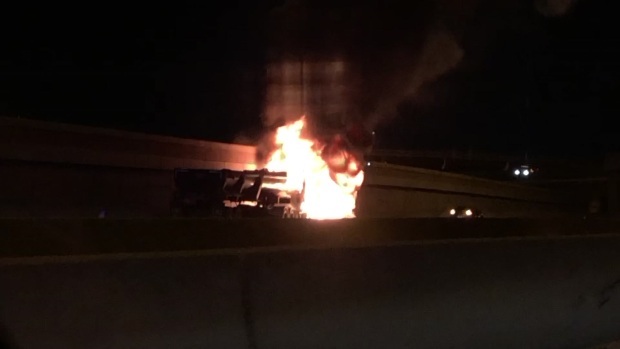 A driver was killed in a fiery crash involving an 18-wheeler and a SUV on State Highway 183 in Bedford Tuesday morning, police said. The SUV veered across the lanes and hit the semi truck about 2 a.m., which was hauling gravel, police said. The driver of the semi escaped the fire and was hospitalized with minor injuries, police said. The driver of the SUV was pronounced deceased at the scene. Their name has not been released. A driver was killed in a fiery crash between an 18-wheeler and a SUV on State Highway 183 in Bedford, police said. The eastbound lanes remain closed at Forest Ridge Drive. All eastbound lanes of 183 were closed until about 8:40 a.m.